The White Sox have fallen to 9-23, better only than the Baltimore Orioles and Cincinnati Reds. With Avisail Garcia and Yoan Moncada joining Carlos Rodon on the disabled list, a lineup with plenty of weaknesses has gotten even weaker, despite the continued improvements of Matt Davidson and Tim Anderson. So, even with the starting rotation showing signs of stabilizing after a ghastly start, they’re currently outgunned almost every night out there. OK, cool, that’s over with. Let’s talk about the minor leagues! 1. Michael Kopech has generally continued to force the issue, although he hit a stumbling block on Sunday. While he won’t be mistaken for Carlos Silva any time soon, 2018 has seen the retention of his second half 2017 progress in terms of limiting walks while pitching against Triple-A competition. He’s done so while deliberately throwing his change-up as much as he possibly can. For the hyper-competitive Kopech, it is probably difficult to maximize the use of your third best pitch, but he and the organization are clearly on the same page that this is the limiting reagent for him taking the next step to ace-dom. If he had shoved again on Sunday, it may have been difficult to keep him down in Charlotte, but even with the poor outing, he is still definitely knocking on the door. Whenever he is called up, he will still have work to do, as fully harnessing this arsenal will be a career-long endeavor. However, as he still has high-90s with life to get out of any jam he’s in, he may need to be facing major league hitters to make further progress. 2. 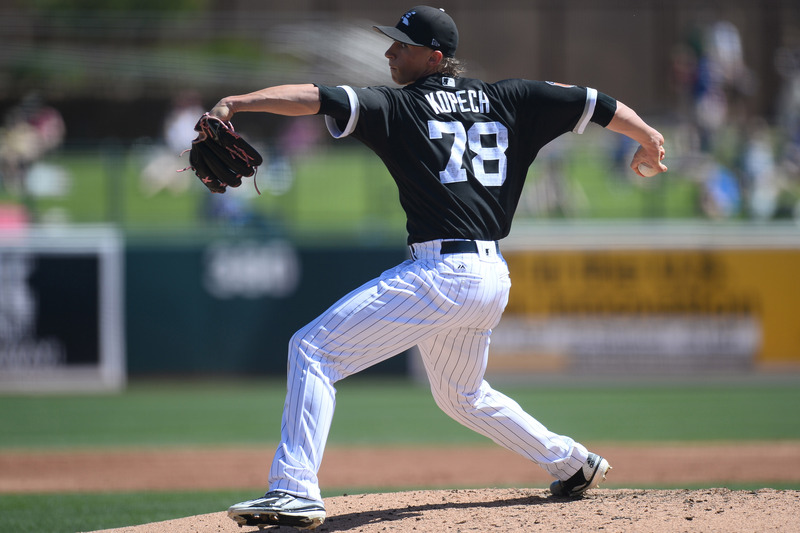 Dylan Cease has generally sat behind Alec Hansen and Kopech on prospect lists as the furthest away and most volatile of the three top pitching prospects. The second piece in the Jose Quintana deal is fairly straightforward: insane fastball, hammer curve, crazy fragile. To wit, he has struck out 12 batters per nine in his minor league career, which, due to injuries, has only been 162 innings over three seasons of pro ball. So far, 2018 has been a huge success, as he is now pitching at Winston-Salem, his most advanced assignment yet, and dominating to the tune of a 1.95 ERA over 32 1/3 innings with 42 strikeouts against only 14 walks. The indication is he hasn’t had any of his stuff eroded by injury to date, and if he can make it to ~120-150 innings without injury he could put himself on the radar for a late 2019 call up and increase the odds he actually leverages his massive potential into a major league career. 3. Luis Alexander Basabe has continued his hot start, which he attributes to simply being healthy as contrasted to last year. With a .299/.419/.598 triple slash so far in High-A, Basabe is making the case for a promotion to Birmingham sooner rather than later. Such a promotion could be paired with a corresponding bumping of Eloy Jimenez to Triple-A. The uber prospect has clearly knocked all the rust off after an injury-delayed start to the year, as a .481/.500/.852 line over the last week has raised him to .319/.347/.652 on the season. There’s no real rush for either of these guys, but at a certain point with Jimenez, as with Kopech, one wonders if minor league pitchers at any level can provide him with sufficient challenge. 4. Dane Dunning continues his ho-hum, clockwork excellence even after his promotion to Double-A. The White Sox have taken it slowly with the relief-to-starter convert, as he was allowed to annihilate Winston-Salem in a second look for four outings to start the year. One suspects they aren’t going to be in any rush with him either, but as a plus-pitch-ability/command prospect, he too may take his timetable into his own hands. And, once you’re at Birmingham, you’re certainly within shouting distance of the South Side, and if he doesn’t hit an innings limit, may even wind up getting some relief appearances in September. 5. Zack Collins is still getting rough reviews for his work behind the plate, but at least he is showing signs that his new swing may be paying dividends in terms of bat-to-ball. His last seven games have seen him hit .381/.567/.524 with more walks than strikeouts. It’s a small sample, but Collins really needs to rake in order to support what looks like a weak glove at catcher or the immense pressure which would be on his bat at first base. The walks and power certainly look like a permanent feature of his profile, and if he has eliminated a flaw in his swing, a .260-.270 average could mean a potential plus bat at the major league level. All of the above are small samples, but — Collins aside — they are largely consistent with what we know of these players in tandem with good health. We all know in the abstract that a brighter future is ahead, but sometimes it helps to get some concrete examples of what that might be.